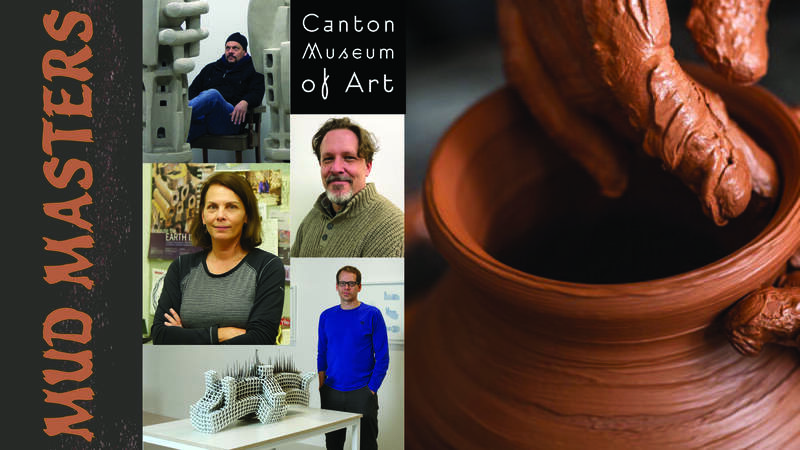 Mud Masters is a one-day intensive arts program put on by the Canton Museum of Art designed to share the unique expertise of 3 nationally recognized artists who work with clay. This event will consist of morning and afternoon interactive sessions with several presenters also having artwork on display in the exhibition; Drafting Dimensions: Contemporary Midwest Ceramics. Open to all, this exposition provides the opportunity to discover various clay working techniques, learn from professional working artists in the field, networking, time to visit the museum galleries to see amazing contemporary ceramics and more! Artists presenting will be John Balistreri, Peter Christian Johnson and Lesley Baker as well as a keynote speaker during catered lunch, Anderson Turner who curated the exhibit as well as achieving success as a professor, curator, writer, art critic and current Director of Galleries School of Art at Kent State University. Push beyond the traditional thought process for clay and learn a variety of modern approaches of using clay in new ways. ***Catered lunch will be provided with a choice between a build your own assorted sandwich spread with your choice of toppings including smoked turkey, roast beef, honey baked ham, roasted turkey, cheddar, Swiss, lettuce, tomatoes, condiments, and assorted breads or a vegan garden salad with assorted dressings all served with your choice of potato salad or chips and cookies for desert. Watch Balistreri demonstrate strategies for building his large-scale ceramic sculptures constructing thrown and coiled forms. Learn logistics, firing approaches and engineering techniques he utilizes to create his sizable pieces that challenge perceptions and capabilities of clay. Bio: John Balistreri is a Professor of Art at Bowling Green State University, where he has been the head of the Ceramic program since 1996. He received his BFA from the Kansas City Art Institute in 1986, his MFA from Kent State University in 1988, and received the Emerging Talent Award at the 1995 National Council on Education for Ceramic Arts (NCECA) Conference. Balistreri also served on the Board of Directors of the Archie Bray Foundation. His articles have been published in Ceramics: Art and Perception, Ceramics Monthly, and American Craft and his work has appeared in many books on ceramic art. Balistreri is best known for his large-scale ceramic sculpture as well as his innovations using digital technology to create ceramic objects using ceramic 3D printing techniques and has been awarded two patents. Delve into Johnson’s methods of creating simple computer generated blueprints that are used to aid in the construction process of his sculptures. Over the course of the conference discover how he utilizes these blueprints to build stoneware structure armatures on which he builds a more elaborate porcelain sculptures. Bio: Peter Christian Johnson is currently Assistant professor of Art at Kent State University after serving more than decade as the head of the ceramics department at Eastern Oregon University. He earned his MFA from Penn State University and a BS in Environmental Science at Wheaton College. Peter has been a Visiting Artist at Alberta College of Art and Design, Australian National University, the University of Florida, Harvard and numerous other institutions. He received the Oregon Arts Commission’s Individual Artist Fellowship, the Ohio Arts Council’s Individual Artist Fellowship, and was a Matsutani Fellow at the Archie Bray Foundation for the Ceramic Arts. He was awarded first place in the 2018 Zanesville Prize for Contemporary Ceramics and an Honorable mention at the 9th Gyeonggi International Ceramic Biennale. His work has been exhibited in Canada, Australia, China, Korea, and throughout the United States. Join Baker as she demonstrates her unique processes of how to transfer screen printed underglaze to wet and leather hard ceramic forms. Learn how to prepare underglazes, printing techniques, and the various ways she transfers her prints from newsprint to ceramic surfaces to create her rich pattern and nature inspired pieces. Bio: Lesley Baker is an Associate Professor at the Rhode Island School of Design in Providence, having recently moved from Indianapolis where she was an Associate Professor at the Herron School of Art and Design for 11 years. She has also taught at UC Berkeley and the California College of the Arts. She earned her MFA at the Rhode Island School of Design in 2000. She received the Emerging Artist award from the National Council for Education in the Ceramic Arts in 2005. She has participated in numerous artist residencies, including the Archie Bray Foundation, the John Michael Kohler Arts/Industry Residency, the Guldagergaard International Ceramic Research Center in Denmark, and the Pottery Workshop in Jingdezhen, China. Her work has been exhibited nationally and internationally and has been published in numerous books including The Yixing Effect and The Best of 500 Ceramics, the newest edition of Ceramics and Print by Paul Scott, and most recently in Cast: Art and Objects Using Humanity’s Most Transformational Process.